Featured in Barclaycard's 'The Globe' magazine, 2017 summer edition - a special report covering Tapestries, my remit within the team. Originally two of us, within two years we've grown the team to six colleagues. The team continues to expand quickly due to the popularity and proven success of our deliveries. 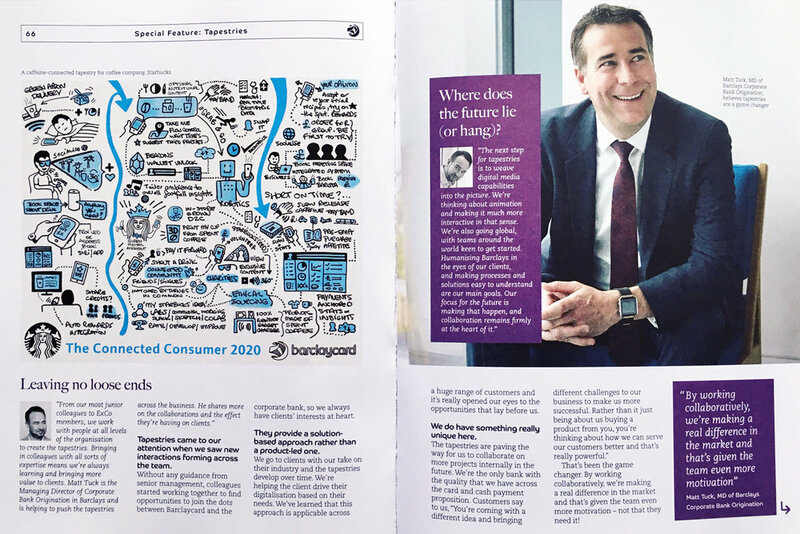 As Strategy Design Lead at Barclaycard Business Solutions, I translate complex business models into future, refined versions of themselves in an easy to digest visual language. 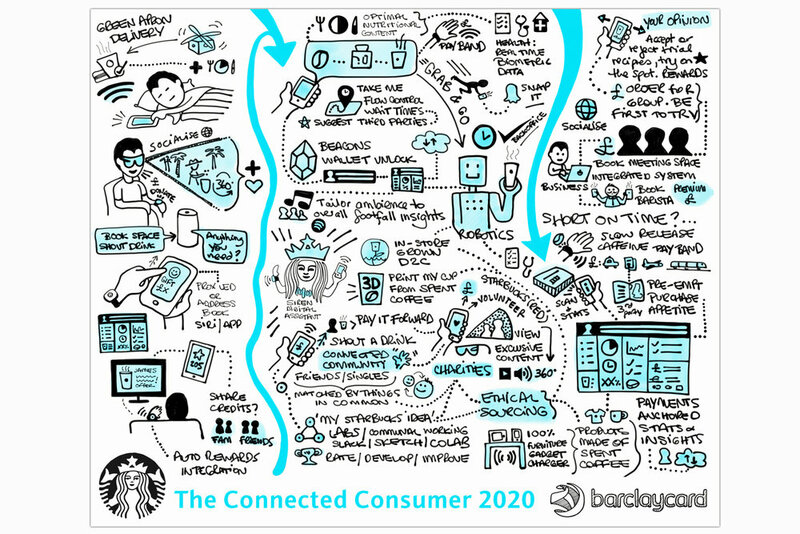 Researching industry trends, technology, digital innovation and competitors I run workshops, focus sessions and map out experiences - always ensuring these are onmichannel, user-centric and seamless. I am in charge of the design team and guide all projects ensuring tone of voice, approach and focus. I am the driver of our visual strategy, passionate about accurately reflecting business needs and consumer demands, internally for Barclays and externally for our clients. I produce on the spot concepting and mapping, sketching directly into my ipad, meaning all illustrations/concepts are my own and tailored specifically for the audience we are targeting. This ensures all steps of the process are not only documented but the creative process is centre stage in each project and an essential part from first meeting to delivery and beyond. I've spearheaded and established a modern and appealing line-based illustration style which has become our signature language - breathing life into each project and helping make us unique. This approach has been revolutionary for the business which depended heavily on vector-based stock imagery: these quickly looked dated and too corporate, failing to reflect our user-centric and humanised vision. This role is senior stakeholder / ExCo + client facing (large corporates) - including pitches, presentations and mapping out of next steps. Our reach is multinational and currently implementing our tapestry approach across Barclays international.